Last time one of us became oftenly work behind his Windows 10 laptop late at night and noticed that after 2:00 PM the laptop begins to slow down. The culprit was found rather quickly, this is a process MsMpEng.exe, which is displayed in Task Manager as Antimalware Service Executable. 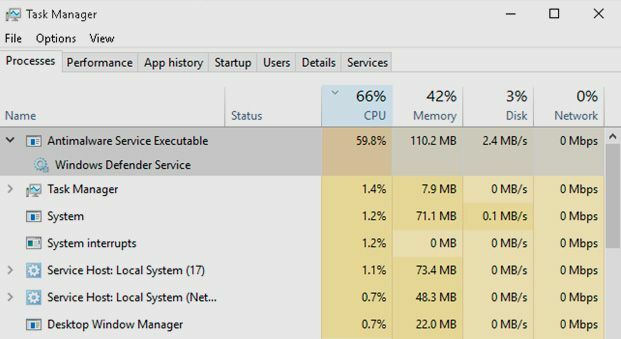 Antimalware Service Executable causes a high usage of the CPU (above 40-50%) and Disk (10-30 MB/s), and working on laptop becomes very uncomfortable. What is AntiMalware Service Executable process? Process AntiMalware Service Executable is a part of the antivirus MSE from Microsoft, in one or another form this process is present in all antimalware products of this company: MSE, ForeFront, Windows Defender (integrated into Windows 8 and Windows 10) and protects the operating system from malware. The reason for the high load on CPU and Disk is the antivirus scanning, which runs in the background and starts by the scheduler at night. Windows assumes that after 12:00 AM nobody works on laptop, and therefore various Automatic Maintenance tasks assigned at this time: virus scan, defragmentation, backups etc. Of course, you can wait until the end of the scanning process, when its activity is reduced and continue to work comfortably. 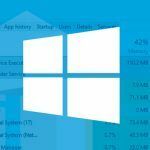 But if the process runs continuously and heavily loads the CPU or disk (it is difficult to open any window or program), you can change the task settings and specify the start time job at a convenient time for you. Tip. If another antivirus product is not installed on your computer, it is not recommended to remove Antimalware Service Executable or completely disable background scanning. 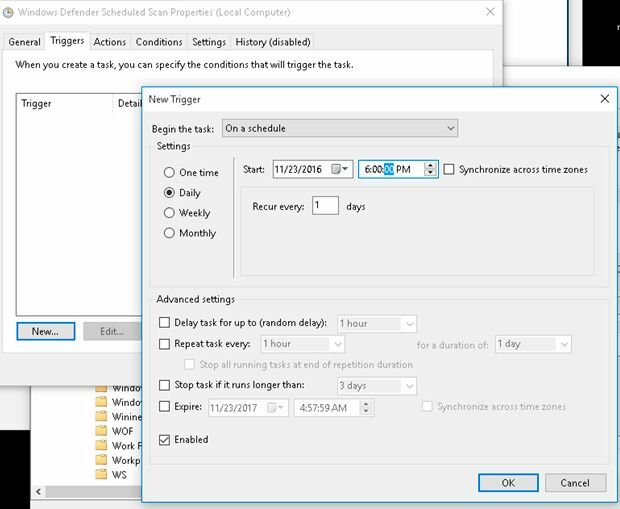 You can modify settings of scanning task in Windows 10 using Task Scheduler. Run Task Scheduler snap in (Taskschd.msc) and expand the following branch: Task Scheduler Library -> Microsoft -> Windows -> Windows Defender. 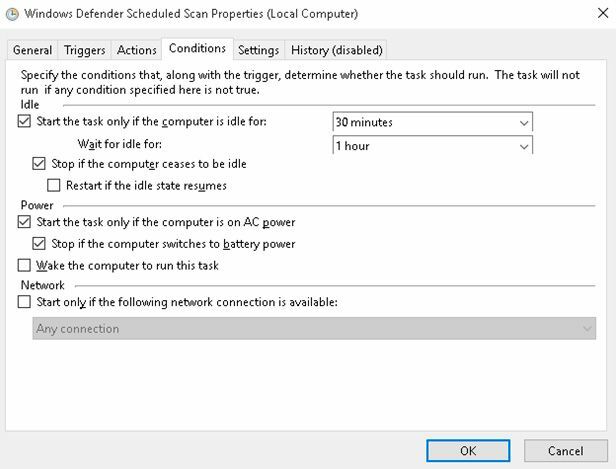 In the task list find Windows Defender Scheduled Scan and then double click on it. It remains to restart your computer to apply new settings by Windows Defender. Thus, this task of Automatic Maintenance will run only when the computer is idle and will be completed during any user activity. Additionally, you can specify your own scanning task start time. 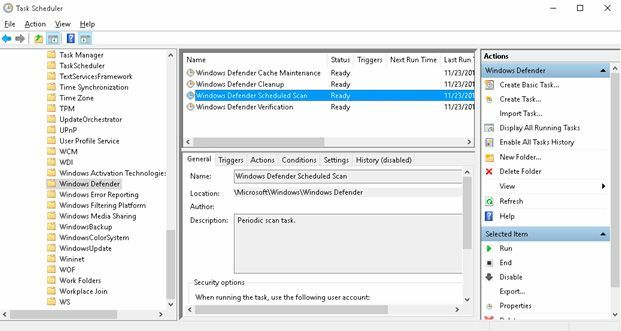 To do this in Windows Defender Scheduled Scan task properties go to the tab Triggers and add new launch schedule. For example, Daily at 6:00 PM.